The SAGE Release Calendar provides SAGE users with awareness of work in progress and a schedule for upcoming releases. You can also view historical release details in the Release History section. Below are the dates of our historical project and maintenance releases. Not included are production support patches that may have gone out intermittently in response to urgent needs. Review SAGE Product Updates for more detailed information on features and fixes for any of the release dates below. SAGE Budget will convert its rounding approach to round-up on tie (like Excel) and to sum up the rounded line item values in totals and sub-totals, when the budget property is set to round. This will bring SAGE Budget totals in sync with the federal RR Detailed Budget totals when budgets are connected, and make for easier Excel comparisons. Updates to conform with V2 header to support applications via Grants.gov and NIH. FORMS-E updates, necessary for NIH proposal submissions with due dates on or after 1/25/2018. Creation of a new setting to allow users to turn salary cascading OFF. By default it will be ON. Improved decimal handling to fix truncation issues and allow flexibility to store decimals in amount fields while viewing the figures as whole numbers. New Locations page allows more detailed identification of sites where research is proposed to take place. This page will also include the Space Planning and International Involvement questions. Updates to SAGE Budget to accommodate new workday data structure for personnel, positions, wages, and benefits. Principal Investigators and Preparers of eGC1s to the Royalty Research Fund (RRF) will no longer receive the automated email sent from SAGE 3-6 days prior to the Sponsor Deadline when the proposal is marked as not ready for submission. This notification was not applicable to RRF proposals and caused confusion. When an eGC1 is connected to a SAGE Budget, links between the two will now display on the My eGC1s and My Budgets task lists, making it quicker and easier to navigate between the two. Users can now enter a Prefix and/or Suffix for personnel in SAGE Budget. These will display on the Budget worksheet, and when using the Grant Runner Budget Sync feature will flow directly to the NIH RR Detailed Budget form on the connected eGC1. This ensures personnel will display on the sponsor form with their preferred titles/credentials. The new Grant Runner Budget Sync feature has been optimized to now perform faster, allowing users to complete their proposals more quickly. The Certify & Route page of the eGC1 has been updated to make routing choices more clear and intuitive. Additionally, when using a Grant Runner eGC1, as long as the eGC1 is marked “Ready to Submit” = No, users will now be allowed to route their eGC1s for review while there are still outstanding NIH and Grants.gov errors. The Cycle view in SPAERC has been updated to include a “Mod Nbr” column to reflect Award Modification Numbers on Funding Actions and Modification Numbers on Subaward Actions. Defaulting logic for the Disposition and Carryover fields on Funding Actions has been revised to improve data accuracy. The Short Title on Funding Actions is now required in SERA prior to save in order to resolve an error that occurred when the Short Title was saved blank. The SAGE team will be focusing the next six months on expanding and improving SAGE Budget capabilities, and streamlining proposal budgeting processes. This is the initial release in a series of SAGE Budget improvements to come in 2019. The SAGE Budget approach to rounding has been changed to better match user expectations and needs. These changes will facilitate accurate integration of budget data into sponsor budget forms when using the new Budget Sync feature. Historically, SAGE Budget has used display-only rounding for individual expense items, and banker’s rounding for totals. Display-only rounding is the equivalent of using the decimal display setting in Excel versus the round() formula. With display-only rounding, you may see a $5 on screen, but the stored value may really be $4.60. This can be confusing for users when viewing totals of display-rounded numbers. The old display-only approach to rounding also resulted in an inability to fully reconcile SAGE Budget numbers to sponsor budget formats, where sponsor budgets require whole dollar entries. Display-only rounding of expenses will no longer be used in SAGE Budget. Rounding is now applied to each expense individually, not just to budget sum totals. Budget sub-totals and totals now display the sum of the rounded expense totals. Users now have the choice to round to whole dollars or to cents (new!) or to not round. When Grant Runner Budget Sync feature is used, the rounded values will flow to the RR Detailed Budget with 100% accuracy. These changes to rounding in SAGE Budget will result in a clearer, more intuitive approach to display of rounded values that accurately matches sponsor budgets that require whole dollars entry. These settings will maintain the integrity of historical budgets and to allow users to make intentional decisions on whether to apply the new rounding methodology to active budgets. When you Copy a budget with the above legacy settings, the new budget (and any child sub budgets) will automatically convert to the new rounding settings. To convert your existing budget to the new rounding approach, go to the Properties tab of your main worksheet, and select the appropriate rounding option. When you change the rounding settings in the Properties for your parent budget, all sub-budgets will inherit that same rounding setting as well. Users will no longer need to manually SAVE between changes to expenses to see the sub-total and totals update. Entry of personnel and other expenses will trigger a recalculation and refresh of the expense totals upon navigating away from the field where the entry occurred. As mentioned in the Rounding section above, the rounding setting now includes an additional option to round to Cents, in addition to Whole Dollar and No Rounding options. Users will now enable Targets and Limits from the Targets and Limits tab. The Budget Setup Wizard no longer includes the Enable Targets and Limits question, and will instead be enabled from the Targets and Limits tab upon completion of the wizard setup. The email notification sent from SAGE to PIs and Administrators at Just in Time when human subjects is marked as YES on the eGC1, has been discontinued. Campus feedback indicated that this email often caused confusion, since it was not an official notice of action from the sponsor, and that the reminder was not helpful to their processes. The Activity Locations and Non-Fiscal Compliance pages were displaying beyond the right border for Internet Explorer users, causing read-only users in SAGE to be unable to access certain expand/collapse controls on the page. The issue has been resolved. SAGE Budget has been updated to clarify to which APL expenses can be manually entered (sub-object codes 19-00 and 19-20) and which are based on the APL setting on the Properties tab (sub-object codes 19-10 and 19-40). An issue with display of the Cognizant Federal Agency POC field on the RR Subaward Budget form has been resolved. The saved data is now displaying as expected on the Grant Runner form. Users will now see a convenient link to the Sponsor Budget Map page from the header of the RR Detailed Budget page, when using Budget Sync. This will serve as a helpful reminder to users that this new page exists and may need actions on their part to fully sync data from SAGE Budget to the RR Detailed Budget. The clearance email, sent from the AUMS system, has been updated to clarify contact and other helpful information for recipients. The SFI Percent Ownership has been updated to address a display issue caused by a rounding setting in the FIDS reviewer module. eGC1 preparers using Grant Runner now have a new feature that allows them to sync a connected SAGE Budget to the NIH RR Detailed Budget. This capability provides a more streamlined experience for preparers by reducing redundant entry. It also eliminates the need for reviewers to cross check the various parts of the application where budget data is stored. Personnel and expense data flows directly from SAGE Budget to RR Detailed Budget, when connected. When updates are made to a connected SAGE Budget the changes will automatically flow to the RR Detailed budget. When users disconnect a SAGE Budget they have the option to keep or clear the data in the eGC1 budget page and the RR Detailed Budget. Connecting your SAGE Budget to a Grant Runner eGC1 with an RR Detailed Budget form triggers the two budgets to sync. When the sync occurs a new Sponsor Budget Map page displays on the left navigation menu and the RR Detailed Budget form becomes read-only. Changes to where the data flows to on the RR Detailed Budget can be made on the Sponsor Budget Map page. Additions and deletions of expenses or changes to expense amounts will be made on the SAGE Budget. The Budget Justification attachment will still be attached on the RR Detailed Budget directly. Finance & Administrative (F&A) flows to section H. Indirect Costs on the RR Detailed Budget with one row per distinct F&A rate and base type combination. The Sponsor Budget Map displays how data flows from SAGE Budget to RR Detailed Budget. SAGE Budget expense items are grouped into sections by Object code. Within each section they are ordered by sub-object code. SAGE Budget data is displayed on the left side of the page. The RR Detailed Budget expense category to which the expense will flow is shown on the right side. Reorder Personnel. Use the drag and drop functionality in the Salaries and Wages section of the Sponsor Budget Map page for easy reordering of Senior/Key personnel. Define Custom Personnel Roles. Drop-down menus allow for remapping to several default personnel project roles or you can create a custom role. Change Defaulted Data Flow. Many expense categories can be changed to flow the data from SAGE Budget to an alternate category on the RR Detailed Budget. Use the drop-down menus at right to specify any changes to the flow. The following changes were made to SAGE Budget, in order to fully meet the data needs of the RR Detailed Budget. Application PI Role Added. Users will now see the Application PI role available in the personnel section of SAGE Budget. Personnel assigned to the role Application PI on the SAGE Budget will flow through to the RR Detailed Budget as the Principal Investigator (PD/PI). If the SAGE Budget had a PI listed in addition to the Application PI, the PI will flow to the RR Detailed Budget under the role of Faculty, and that role can be modified on the Sponsor Budget Map if necessary. Additional Role Updates. The Fellow role is no longer available in SAGE budget. , iInstead new roles have been added to match those in the RR Detailed Budget. The new roles include: Faculty, Post Doctoral Associate, Graduate Student, Undergraduate Student, Secretarial/Clerical. TBD & Non-UW Personnel: Monthly Salaries Now Editable. In order to identify Base Salary on the RR Detailed budget for TBD and Non-UW Personnel, the UW Monthly Salary and Clinical Monthly Salary fields are now editable in the SAGE Budget personnel entry section (for TBD and Non-UW Personnel entries only). Travel Destination Logic Modified. In order to improve data quality and reduce the need for adjustments to the budget, the travel destination (domestic or foreign) will now default based on the sub-object code chosen by the user. If “foreign” is explicitly referenced in the sub-object code name, then “foreign” will become the defaulted destination location. Users can adjust the destination as needed for sub-objects codes that could apply to either. Sub-Object Codes added. A detailed analysis comparing sub-objects codes between the Finance System and & Sage was completed, and the missing object codes were added to SAGE Budget to keep the two systems synchronized. Improved Error Messages. Validation messages on the RR Detailed Budget have been improved to now include the specific period and section that requires the user’s attention. Validation Icons Added. The Sponsor Budget Map has the same validation icons as the rest of Grant Runner. If there are unmapped items on the Sponsor Budget Map the user will see red exclamation points on the individual sections to indicate which section needs their attention. Once in the section the field in question is highlighted red. When the mapping issue has been resolved, the validation icon will turn to a green checkmark. The SAGE User Guide has been updated with detailed instructions for the Budget Sync feature. Users can access it by clicking on the help icon (?) on the Sponsor Budget Map page and on the RR Detailed Budget form. SAGE 102 courses will also include a section on the Budget Sync feature and using the Sponsor Budget Map. For eGC1s that are in the Status of Approved, Awarded, or Denied by Sponsor, there will be two places where a user can link directly to MyResearch, to view processing details like holds placed on items, or comments left by OSP or GCA as funding actions are being set up. For eGC1s that are in Composing, Routing, or In OSP status, the left navigation element will not be shown, and the hotlink from the eGC1 status on tasklist will behave as it currently does (Routing or In OSP status takes a user to the Approvals page; Composing items have no hotlink on Status). In order to provide a more consolidated area for setup and viewing of award terms, a new section called Terms & Conditions will be added to the Funding Action. The new fields above, plus the previously labeled “GCA Flags” will bundle under this section, along with Payment Type and Equipment. The new Funding Action fields listed above will be added to the eFA Receipt PDF, which is sent to campus when GCA completes processing of a new action. The new Terms and Conditions section referenced above will be added as well, and all available data in that section of the FA will display. These changes will give campus more comprehensive information on new awards, and will match the language of the FA with that of SPAERC and SERA, which will aid communications between campus, OSP and GCA. The body of the email that contains the FA Receipt PDF will now include an explanatory statement related to budget setup, to clarify that budget data will not appear in MyFinancial Desktop, Grant Tracker, and Ariba until the day after budget setup is completed in the Finance System. The new funding action data fields will be added to the GCA Pending Actions Report in SERA. To streamline award setup when the Sponsor is Royalty Research Fund (RRF), many of the Funding Action fields will default a value but remain editable. SPAERC users can now easily tab through the fields of the Funding Action and perform their entry using only the keyboard and with a logical flow. This change will bring the funding action up to accessibility standards and provide users with added efficiency gains through less scrolling and repositioning of the cursor. Grants.Gov has changed the way that proposal submission data files are to be structured, with the addition of a new header and hash. The changes will allow for a cleaner way of identifying a unique funding opportunity and formset, through introduction of a PackageID into the header. The Grant Runner system is updated to comply with this new change. The affirmation statement found on the FIDS Complete Disclosure page was changed to remove a School of Medicine-specific reference that could more generally apply. The statement now includes the agreement to include “further details of my financial interests, as requested by the Office of Research and, when applicable, the Office of the Vice Dean for Research, or their equivalent in my school/college…”. The email that AUMS applicants receive when a consult with the Occupational Health Nurse is required has been updated with new contact information and guidance, due to recent organizational and business process changes in EHS. Automated emails sent to eGC1 reviewers in Environmental Health & Safety have been updated to reference the new Non-Fiscal Compliance questions. When the eGC1 indicates the presence of flow-through funding on the Details page, selection of an Originating Sponsor will now be required prior to completing the eGC1. Following the 5/17 release of the Non-Fiscal Compliance page, a number of minor updates, infrastructure improvements, and bug fixes are included to stabilize that section going forward with completion of the SAGE Compliance Improvements project. When the eGC1’s Sponsor or Originating Sponsor is the National Science Foundation, the OSP assignment will now default to the GCC role on the appropriate team. When the eGC1’s Sponsored Program Activity Type is the IPA/JPA/Staff Assignment, the OSP assignment will now default to the GCC role on the appropriate team. The background color in SPAERC has been lightened to provide more contrast with the text to improve readability. The eGC1 Compliance Questions and Explanations pages have been replaced by a new page called Non-Fiscal Compliance. This consolidation provides a more streamlined experience for preparers and reviewers. Updated questions reflect current institutional needs, with improved clarity in mind. Links to supporting guidance have been added to assist preparers in understanding the policies and regulations behind each question. You can review the updated questions by visiting this page..
Design improvements make the page easier to navigate and gauge progress toward completion. eGC1s that are in routing at the time of this release will display the old compliance questions that existed when the eGC1 was initially routed. However, any eGC1 that is returned or withdrawn after the release will be reset with the new compliance questions. Answers to the previous questions will no longer display. Plan for additional time to re-complete that page in case a return or withdrawal is necessary. 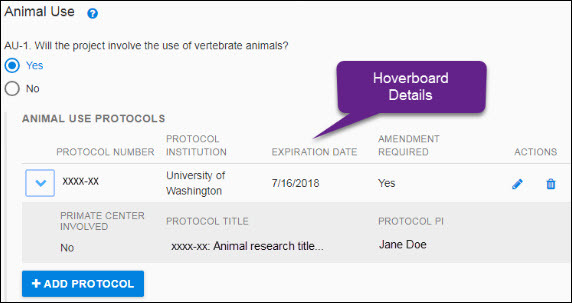 Human Subject (Zipline) and Animal Use (Hoverboard) protocols can now be linked to your eGC1. Searching by IRB Application Number or IACUC Protocol Number will allow you to pull in real-time information, reducing manual back-and-forth between systems and improving the accuracy of protocol details in SAGE. From any standard eGC1 page (excluding Grant Runner forms), the URL is now a direct link that you can copy and share with others who have access to that eGC1. This will be particularly useful when collaborating with the PI on completing the Non-Fiscal Compliance page. Currently, only one person can edit an eGC1 at a time. However, the Non-Fiscal Compliance page can now be edited, even while someone else is working in other areas of the eGC1. This will avoid situations where the PI could be blocked from contributing to the Non-Fiscal Compliance page while the administrator is currently editing other areas of the proposal. To assist researchers in filling out the Human Subjects & Clinical Trials (HSCT) form, NIH required fields are now indicated with an asterisk and red highlighting. These same fields will have validation messages when the user clicks “Show Form Errors” at the top of the form. All NIH errors and validations will continue to show when the full application is checked by clicking “Check for Errors” in the left navigation of SAGE. To help prevent data inconsistencies when multiple browser sessions are open, the data sync between the eGC1 and Grant Runner forms has been improved. When you make updates to information in the eGC1 that flows through to Grant Runner forms, those updates will now automatically sync with each save/refresh of the eGC1. To meet accessibility standards, all Grant Runner forms are now accessible using keyboard only functionality. In addition, tab order has been improved to be more logical and intuitive, reducing the number of times the user has to press the tab key. Question numbers have been added to error messages on all Grant Runner forms. This update will help users quickly identify the specific error within a form. This will be especially helpful for longer forms such as the new Human Subjects & Clinical Trials form. Grant Runner can now be used for Fellowship (F) Award opportunities with the inclusion of the PHS Fellowship Supplemental Form. Any previously entered data on the HSCT Full Study will be overwritten. After import, the eGC1 preparer is free to edit any of the information as necessary. ClinicalTrials.gov data is NOT updated directly from SAGE. It is still the PI’s responsibility to maintain accuracy of data on the ClinicalTrials.gov site. When adding an Application PI or a Multiple PI on the PI, Personnel, & Organizations page, if the selected personnel does not have an ASTRA role that grants them access to SAGE, you will now receive a warning. This information will allow eGC1 preparers to request ASTRA roles in advance to avoid delays at time of routing and approval. Users were getting confusing validation messages when attempting to add themselves or another person to more than one role on the Contacts & Assign Access page. This validation issue has been resolved. SAGE Suite will now use the new version of Person Web Service (PWSv2). PWSv2 is commonly used in the SAGE Personnel Chooser when searching for non-UW people. In some areas of SAGE, the Personnel Chooser was requiring users to click on “Enter” to search. This issue has been resolved and now you can search by either clicking on or pressing the “Enter” key. Obtaining the responses to these questions upon import will better enable the SAGE system to communicate clear form rules and requirements to users through validations and on-screen prompts. SAGE will now use the NIH Clinical Trials Code provided with each opportunity to enable or disable relevant sections on the HSCT form. The system will also factor in the responses to the four Clinical Trials questions (1.4.a through 1.4.d) on HSCT, to determine when the clinical trials sections should be enabled. Due to the dependencies between forms, the Other Project Information form now displays above the Human Subjects & Clinical Trials form. This helps you complete the forms is a logical order, thereby reducing confusion when opening the Human Subjects & Clinical Trials form for the first time. Due to time zone differences and the date/time stamp used by NIH on the opportunities posted on Grants.Gov, the open and close dates were displaying in Grant Runner as one day earlier than on the Grants.Gov and NIH websites. SAGE now factors in this 3-hour time difference so that the open and close dates display correctly. An issue was resolved which now allows the RR Detailed Budget PD/PI validation to work properly when an Application PI is listed on the eGC1. The validation will now ensure that the first and last name of the first PD/PI listed match those of the Application PI, when present, and as shown on the SF 424. This is an NIH requirement. Users will no longer receive an error when attempting to print the Draft Routing Sheet from the Certify & Route page of the eGC1. If you prefer to manually enter wage-related values across all years of your multi-period budget, you may now choose to turn off cascading of salary data on the Line Setup screen. Cascading of salary data will be turned on by default. When you change either the Monthly Base Salary amount or Salary Inflation Rate, all future period Monthly Salary Base values will be updated. The “Effort” section values, salary inflation rate, and any prior period entries will be unaffected by cascading, so that any custom entries will be retained. On the Update Periods screen for Salary, if you click “Update Salary” for a particular period, the Inflation Rate will no longer reset to the original value. The inflation rate will remain unchanged, and only the Monthly Base Salary and related salary total calculations will be updated, with cascading updates to future periods when cascading is on/checked. On the Period Update screen for any line item, when you enter a decimal into an entry field, the full number entered will be visible when you click in the cell, regardless of the Display Setting for decimals. When you click away from the cell the value displayed will be based on the Decimal Settings in the Properties tab – Advanced Budget Settings. On the Update Periods screen for Salaries on an APL budget, you will now see both the APL Benefit Rate and the APL Leave Rate displayed. This will be helpful in understanding and verifying the Total Benefits calculation, which is equal to the combined APL Benefit and Leave Rates multiplied by the Period Salary. In addition, when you click the “Update Rate” link, the APL Benefit Rate and the APL Leave Rate will refresh with the correct values. For APL budgets, SAGE is now updated with the current Pro-Rated Direct Cost (PDC) rate and updated calculation logic. The calculation of the PDC cost amount is based on total APL modified total direct costs multiplied by the PDC rate. The PDC amount also now shows as a distinct line item on the parent budget, under object code (19). The parent budget total F&A is now showing the combined roll-up of all F&A, inclusive of internal UW sub budgets. Users no longer need to add the parent and sub budgets together for a combined total. For budgets that include one or more subcontracts, the $25,000 cap for inclusion of subcontract costs in UW’s F&A base will only be applied when the base type is MTDC. All other base types will calculate F&A on the full amount of the subcontracts. The custom base type can continue to be used for situations where the sponsor has irregular rules around how F&A can be charged. 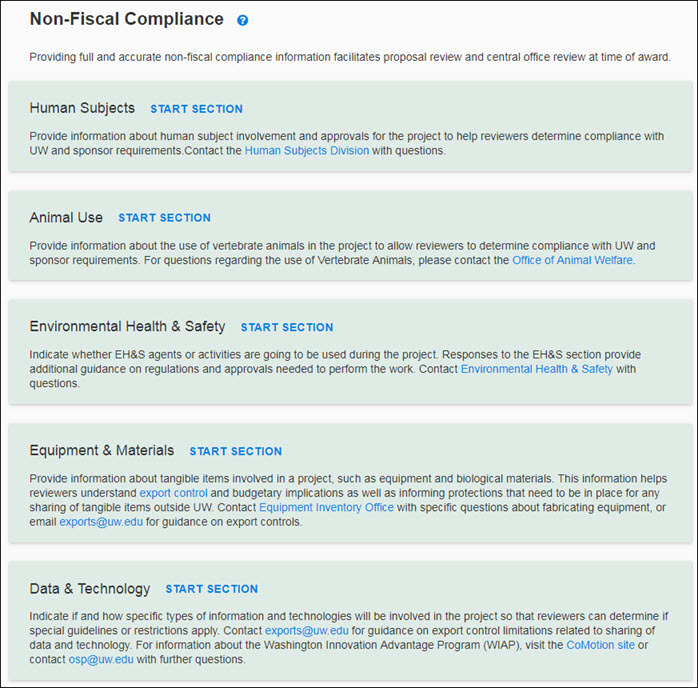 As part of a larger effort to improve usability and content of the eGC1 Compliance page, this release makes a number of alterations to better focus the Compliance page on non-fiscal compliance questions. This was accomplished by either removing questions or relocating them to more intuitive sections of the eGC1. There are more changes coming to the Compliance page in a later release that will build upon these enhancements. A new page has been added to the eGC1 that centralizes details related to the location of research activities in a proposal. Includes identification of each location where UW research activities are taking place along with details helpful for budgeting and F&A rate determination. The Location Search integrates with the UW’s space tracking system GeoSIMS, allowing you to partially enter a facility name, address or facility code and populate the eGC1 with the data for that location. You can also manually enter locations not found in GeoSIMS. Includes the “construction or renovation” question formerly on the Compliance page, along with approval details when answered ‘Yes’. Includes the international involvement question and country identification formerly on the Details page. Country is now sourced from the more comprehensive international standard ISO 3166. This new page introduces an updated, intuitive and more modern experience for SAGE. Based on feedback from users, we will be incrementally updating SAGE to new design standards with each new release. The existing FG-1, FG-3, and FG-7 compliance questions related to fiscal compliance have been relocated to the top of the Budget page (now rebranded “Budget & Fiscal Compliance”), along with the useful explanations when ‘Yes’ is selected. The existing NG-3 “originating sponsor” compliance question has been relocated to the Details page directly below the Sponsor selection. The international involvement question has been relocated to the Activity Locations page. The existing FG-8 Compliance question on interdisciplinary facilities, service centers, etc. has been relocated to the PI, Personnel, & Organizations page. In a previous release, the FG-9 “other organizational reviewers” question was relocated to this page as well. With these two changes, you can now better manage your eGC1 approvals in one location. The “reset form” icon on the upper SAGE toolbar has been removed. Removal of this rarely used feature will allow the application design to progress to more modern standards. A new question has been added to the FAs, PACs, and NAAs in SPAERC for OSP post-award administrators to indicate when an agreement includes an upfront exclusive commercial license or ownership over the project’s intellectual property. CoMotion will receive notification when these are marked YES in order to get a jump start on IP negotiation. An issue that was causing internal OSP notes for subawards to display in SAGE under “Latest Update” for requests in process has been resolved. The “Latest Update” will now only display the most recent status update and any accompanying comments to/from campus and OSP. For certain types of funding applications, there is a need to list a PI (Principal Investigator) on the sponsor application forms that differs from the PI on the eGC1. This is often the case with NIH Career Development mentored opportunities and Fellowships, when the PI on the sponsor forms does not meet the eligibility requirements necessary to serve as a UW PI. In order to better identify and accommodate this situation, a new personnel role type has been created on the “PI, Personnel and Organizations” page, called “Application PI”. When the Application PI role is selected, additional contact details for person will display and be editable. This will allow preparers to call out the contact information to be used on the sponsor forms. This is particularly important for NIH applications using Grant Runner. This new role should only be used when there is a need to designate a different PI on the sponsor forms than on the eGC1. When an Application PI role is assigned to a personnel entry, and Grant Runner is being used to complete the sponsor forms, then the Application PI name and contact information will automatically flow through to the SF 424 and Key Person Expanded forms where the Application PI is listed. When an Application PI is identified in the Personnel section of the eGC1, that individual will automatically be added to the approval graph, directly after the eGC1 PI. As such, they will automatically receive the same approval notification email that the eGC1 PI receives. When the Application PI initiates their approval, they will be presented with an Assurance Statement, in the same way that the eGC1 PI is. Their approval will also represent that they have read and are providing the appropriate assurance as required by the sponsor. In order to improve efficiency and ensure compliance with federal rules around provision of assurance statements by Multiple PIs, SAGE will now automatically add personnel with the role type of Multiple PI to the approval graph. As is the case for the eGC1 PI and Application PI, the Multiple PIs will automatically receive approval notification email, and will be presented with an Assurance Statement at time of approval. You can now add personnel to a budget as they transition from one position to another. The rate will update for that period and no other periods. If you have previously set a custom rate, the “custom” checkbox will be cleared. Now on the F&A tab in a budget, when you “refresh rate” the “custom” check box and any justification text will be cleared for all periods and reset to the base rate. When a user inadvertently attempts to add the PI to the Personnel section of the eGC1 or attempts to add one of the personnel as a PI, the system will now provide a clear message that a person can only be added to the PI, Personnel & Organizations page once. Grant Runner now includes the PHS 398 Career Development Award Supplemental form, allowing you to use Grant Runner for most Career Development (K) Award opportunities. One exception exists for those mentored opportunities in which the PI listed in the SF 424 application form is not the same as the UW PI on the eGC1. This situation occurs when the PI on the application form does not meet UW PI eligibility requirements and the mentor is listed as the eGC1 PI. For these K Award activity codes that draw applications from individuals ineligible to be a UW PI, another method should be used for sponsor form completion, or wait to complete the eGC1 until the mid-September SAGE release when that capability will be delivered. While checking for errors on individual forms in Grant Runner, you see more of the NIH validation errors display. This expansion focuses on identifying those fields required by NIH but not by Grants.gov. For Example: the Research Plan – Specific Aims attachment, which is required by NIH for opportunities other than DP1 and DP2. You can now view or print a single Grant Runner form and its related attachments in the PDF format used by NIH reviewers. This feature offers an easy side-by-side comparison of the form with the eGC1. NIH requires the use of application packages with a Competition ID of ‘FORMS-E’ for due dates on or after January 25, 2018. Opportunities using FORMS-E will begin to post on October 25, 2017. In preparation, we have completed development on FORMS-E for all existing Grant Runner forms, plus the new Career Development form. These changes will not be visible to users until the FORMS-E opportunities begin to post in October 2017. The new Human Subjects and Clinical Trials form will be released in October, 2017, and more information on that form will be shared out closer to that time. When you click the “View Grant Runner Forms (PDF)” link, you no longer see the word “submitting” while the system is generating the PDF. This change prevents unnecessary confusion. Large file sizes on Grant Runner attachments were preventing the full application PDF from rendering, due to size limitations enforced by the server. The size threshold has been increased to the level recommended by Grants.Gov. eGC1 users no longer see the “Animal Subjects” reviewer on the approval graph, for the above application types. At the bottom of the task list, the “About SAGE” and “Learning” links are fixed and you are directed to the appropriate support documentation for those topics. An issue arose following the Workday implementation whereby manual updates that investigators made to their title were not saving properly, and instead were being overwritten by the Workday titles. This issue has been resolved. An issue has been fixed for SAGE Budgets that utilize Sea Pay where previously opened/expanded sections of the budget worksheet were closing on SAVE. These sections will now remain open on SAVE. The Update Periods page for SAGE Budgets that utilize Sea Pay has been updated to move the SAVE button from the bottom to the top of the page, for a more consistent user experience. SAGE was updated July 6th to reflect Workday salary and payroll data. This release includes a few fixes to the SAGE system. SAGE Budget for Student Aid: The Update Periods window for (08) Student Aid now displays the correct summary amount and no longer displays the unnecessary “Line Setup” button. For Salary and Wages lines created or last updated with Workday data, the Line Setup modal will allow you to “Update” the salary if the above criteria are met. SAGE Suite will now use Workday data rather than HEPPS data. Technology updates were made to modernize and stabilize SAGE system as areas of the software were updated. Title will display the more useful Academic Appointment title when available. If not available, then Position title will display. Academic Appointment Type will display next to Title. This is new data available through Workday that provides information about the nature of the Academic Appointment. Academic Appointment Types can be Primary, Joint, Dual, or Admin. Academic Appointment Types are not applicable to Positions. An indicator of a person’s Primary Position now displays next to the unit where the Primary Position resides. Primary Position replaces the former “home department” concept when determining necessary approvals. The former FG-9 Compliance page question for identifying additional organizational reviewers has been moved to the PI, Personnel & Organizations page, to align it with the personnel entries that are also feeding the approval graph. While selecting personnel, if joint appointment units need to be identified, you can now do so from the same page. The View Approval Graph link will now show in two places on the eGC1 — on the Certify and Route page (as always) and now also on the PI, Personnel & Organizations page. While you are changing personnel and adding additional organizational reviewers, this newly added link will allow you to quickly view the impact of your changes on the approval graph. Once a person and their corresponding position have been added to the list of personnel, you will now see the organizational units for both the selected position and primary position for the chosen person. This will be a reminder that the primary position’s organizational unit will appear on the graph as well as the selected position. The additional organizational unit reviewers question (FG-9) has been relocated to the bottom of the PI, Personnel, & Organizations page (see above for more details). Primary Position Unit will now be used for adding Reviewers/Watchers to the Approval Graph, as the unit associated with the Primary Position replaces the concept of “home department”. Restructured to accommodate Workday data integration. Are less granular in Workday with only one digit of sub-object code. They are associated with Job Profile and linked to Position rather than Distribution. Impacted Object codes are 01 Salaries and wages, 07 Employee benefits, and 08 Scholarships and awards. All ‘01-1X’ → ‘01-10’; ’01-2X’ → ’01-20’; etc. Historical sub-object codes are still available for manual selection – if desired; user can select the old/more descriptive title description. The extra modal for Multiple Object Code types has been eliminated. The system defaults the object code to the one associated with the person’s Primary Position. SAGE will now derive insurance and retirement benefit eligibility using the person’s Primary Position Object Code based on info provided by MAA as part of UW GIM3 fringe-benefit-load-rate. This derivation of benefit exemptions works for all object codes except 01-70 (professional staff), which will default to “None” (no exemptions). For ’01-70’, there will also be an alert/message asking verify and update health and/or retirement benefit eligibility for professional staff personnel. In Workday, Earning Codes replaces the concept of Earn Types. Earning Codes are less granular and do not map exactly to historical Earn Types. Earning Codes will display on the Line Update page under Pay Type, providing additional context about salary and wages. Salary and wages that are considered IBS will now be pre-checked based on the updated GIM 35 definition of IBS. Reduced responsibility cannot be uniquely identified in Workday, so the RRD personnel notification email from SAGE that’s sent post-award has been discontinued. SAGE does not receive any retiree Supplement data from Workday. Retirees without regular salaries but with active Academic Appointments can be added to your budget but salary and benefit information must be added manually using the [Starting Monthly Salary] field. Stipends information under object code ’08’ is available as Stipends without benefits under ’08-00’ (less granular object code). Stipends under Object code ‘08’ are not considered UW Salary or IBS, and are excluded from benefit calculations. There are 2 separate branches of distributions in Workday: planned compensation and period pays. Both are included in salary calculations for all salary fields. If current planned compensation and period pays, we will include those. If no current planned compensation or period pays are available, SAGE will utilize future dated data. The SAGE Budget worksheet will now display an “H” icon next to Salary and Wages lines last updated with HEPPS data. If you edit a HEPPS Salary and Wages line, the Line Setup modal will provide a link to “Convert” the salary, which will remove all HEPPS earning lines, and re-add the person’s latest salary lines from Workday. Prior to the removal, the system keeps a snapshot of the HEPPS earning data. The instant of the snapshot can be viewed using the History tab of a budget. For Salary and Wages lines created or last updated with Workday data, no “H” indicator will display. The Line Setup modal will allow you to “Update” the salary (no conversion is needed). The Update Periods modal has all periods displayed on the same page for the selected line item. With the right access, the user can update salary and benefit for each period (and thereafter). However, if the selected record is personnel from HEPPS, then the Update Salary link will not be visible. The Update Salary link only works for Workday data. The display of Sea Pay personnel and salary info has been rearranged and shown with multiple periods. # of Hour info for each period can be entered on the same page. The “NOTES” icon has been removed, and a note section is added to the line Item setup page. Instead of going to Period 1, 2, etc., user can access the new Line Item Update page directly by using the “Go to Iine Item Update”. The Line Setup page includes all periods on the same page. Other than the calculated fields such as % and totals, cells for all periods can be edited together. However, the totals are not recalculated upon entry, but upon leaving. User will only be able to view the new totals after Return to Worksheet. Key changes to Grant Runner validations and error checking. All NIH Validations Included — SAGE will now incorporate all NIH validations into the error checking process, when users click the “Check for Errors” link. These validations are the same rules applied by ASSIST and eRA Commons. This should help users to identify issues earlier in the process, in advance of proposal submission. SAGE will display both NIH errors and warnings. Warnings will not block submission, but may reveal other issues to be considered prior to submission. Revised Check for Errors Page — The redesigned Check for Errors page will provide a full set of validation checks and errors for eGC1 pages as well as Grant Runner forms. For quick access, a new “Check for Errors” link has been added below the set of Grant Runner forms (see image below) on the left navigation menu. It will continue to display in its usual location on the Certify & Route page. Form Level Validations — The “Show Form Errors” link at the top of each Grant Runner form displays data entry validations on that form only (for example, date formats, required fields, etc.). Users should use the Check for Errors process for complete business rule validations and error checks. Grant Runner users will now be able to generate a single PDF that combines all of the sponsor forms and the related attachment content. The layout of the PDF will be the same as the NIH reviewers see, and can be printed or circulated via email. 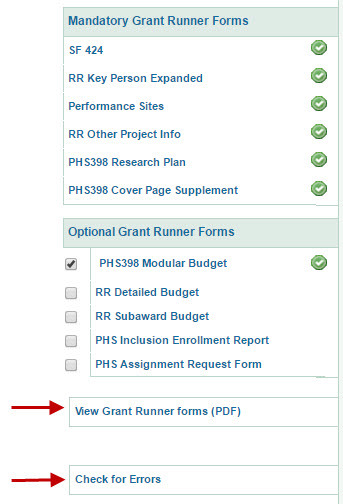 To generate the single PDF, users will click on the new View Grant Runner Forms (PDF) link, found in the left navigation menu, just below the set of Grant Runner forms. (See image below). The Activity Code for the selected opportunity will display on the Abstract & RFA/RFP page for Grant Runner applications. This field is read-only. The new Check for Errors link on the left navigation menu will also appear for non-Grant Runner (standard) eGC1s. Grants.Gov will be releasing new versions of select forms by end of October, primarily due to some forms reaching their expiration dates. Two Grant Runner forms will be updated as a result: RR Detailed Budget and RR Subaward Budget. The RR Detailed Budget will display a new “Total Costs and Fees” calculation for each period, and for the cumulative budget. This will be visible for any opportunities utilizing version 1.4 of the RR budget form. Clinical Research Budget and Billing (CRBB) has provided improved language and helpful alerts surrounding the HS-1-B compliance question. If you answer YES to HS-1, (Does this application involve the use of human subjects? ), the HS-1-B compliance question appears. It will ask you about the use of UW Medicine Health System clinical services, procedures or tests in regards to human subjects use, and provides additional details intended to help you answer the question more easily. The AUMS review complete email was updated to include the Health and Safety specialist in the Primate Center on the email distribution list. The SAGE training environment has been updated to allow any user with a UW NetID to create test records in the Subawards section. Users no longer need to have the Subaward Preparer ASTRA role while working in the training environment. They will, however, still need to have the Subaward Preparer ASTRA role when working in the production (live) environment. The training environment release was made on 11/1/2016. An issue which was causing the “My Approval Date” of an eGC1 to be updated when an approver comment was added at a later date, has been fixed. With this change, the original approval data will remain intact, when a subsequent comment is added. An update has been made to the subawards Notification of Return email, to clean up some accidental html characters displaying in the content. The new PHS Assignment Request Form, introduced with the Forms-D changes, is now available in Grant Runner. This new form will be available to all applications in progress as well as new Grant Runner applications where applicable. The default tuition inflation rate in SAGE Budget has been changed from 10% to 3%, to provide a more realistic figure and reduce the need for manual overwrites. An issue was resolved which was causing an error when users were attempting to connect SAGE Budgets to an eGC1 under a certain set of circumstances. An issue was resolved which was causing the investigator flag on the eGC1 personnel list to revert to YES when a user connected a SAGE Budget to an eGC1. An issue is resolved which was occurring when a user changed the role type on personnel from one where Investigator status was automatically defaulted to YES (such as PI or Co-PI), to a role where they should be able to designate YES or NO (such as Mentor). The system was not displaying the YES/NO option in these cases until the screen was refreshed. It will now display the correct investigator options in real time. An issue has been resolved so that costs in object code 38 (Unallocated) will now be itemized under Other Direct Costs in the SAGE Budget Excel export that matches the NIH Detailed Budget form format. The new Subawards section in SAGE marks a change in both business process and system usage. An Outgoing Subaward Workflow Diagram is available for your reference. Users must have the “SAGE Subaward Preparer” role to create new subaward and modification requests. ASTRA: Who Can Authorize me? ASTRA: Who Can Authorize me? Based on your feedback, enhancements will be prioritized following this initial release. A new compliance question, AC-1-D, has been added to identify grants that will require a Significant Change at the time of submission. An answer is required if the Animal Use question AC-1 is answered “Yes”. Updating electronic document submission contact info. With this change, all active staff in the Person Web Service will continue to show in the results on staff search, but those without NETIDs will not be selectable, and users will see a note indicating that the NETID must be established before the person can be selected. Allowing personnel without NETIDs to be selected as personnel caused errors on the personnel list afterward. Grants.Gov will be updating its systems to FORMS-D, for all applications submitted for due dates on or after May 25, 2016. The Grant Runner forms that will be updated to comply with FORMS-D requirements are identified below. There may be some application packages which include both a FORMS-C and a FORMS-D as options, and in this case users will be prompted in SAGE to select the appropriate one based on the due date. Per NIH, FORMS-C application packages will be set to expire after the May 7, 2016 AIDS due date. A new “Vertebrate Animals” section, which includes questions on euthanization and use of AVMA guidelines. For Grants.Gov FORMS-D, users will notice a new form called “PHS Inclusion Enrollment Report” in Grant Runner. This single form will replace the 2 separate forms in FORMS-C applications (Cumulative Inclusion and Planned Enrollment Report). With the Forms D changes, users will notice some additional fields to identify the type of reporting being done (“Delayed Onset Study?”, “Enrollment Type?”, “Existing Data Set or Resources?”) When “Delayed Onset Study” is marked YES, the remainder of the form will be disabled, per form rules. In order to aid in the analytics of Grant Runner usage, the SAGE system will begin to retrieve and store the Activity Type code from Grants.Gov, as we are retrieving submission status information. An issue that was causing users to receive an error when trying to discard advances has been fixed. SAGE users can now permanently withdraw eGC1s that are in “Withdrawn” or “Returned” status. Previously, only OSP could mark eGC1s as “Permanently Withdrawn”. This will provide SAGE users with a way of quickly removing eGC1s from their tasklist that are no longer being considered for submission to a sponsor. SAGE users can now mark “Approved” eGC1s as “Denied by Sponsor” and attach related documentation. Previously, only OSP could set eGC1s as “Denied by Sponsor”. This will provide SAGE users with a quick way of clearing eGC1s from their tasklists that are no longer being considered by sponsors, and improve the accuracy of proposal data. A new multi-select Country field has been added to the eGC1, to track where international work will be performed. This field will be visible to users only when they answer “YES” to the question of whether work will be performed internationally. This country-level data will be used in reporting and analytics. The Sponsored Program Activity Type field on the eGC1 and FA was amended to allow users without a mouse to utilize the drop down control with keyboard alone. This change supports making the SAGE application more accessible. The expand/collapse capability in the drop down is also removed, since this was causing some confusion with users. The list of selectable options will be fully expanded, within their respective categories, making for a more intuitive user experience. Bug Fix: An issue that was causing eGC1 approval snapshots to not display attachments that had newer versions uploaded after the snapshot was taken has been fixed so that all point-in-time versions of attachments display in approval snapshots. The Subaward Status Report will be located in the BI Portal and will replace the existing static report found on the OSP website. This version will be near real-time (data refreshed nightly), giving campus more timely information on the status of their pending subawards, and will alleviate the time consuming preparation done by OSP in posting the current static report. Note: This report will be available in the days following the SAGE release. The EHS-2 question on the Compliance Questions and Explanations pages of the eGC1 has been updated on all new eGC1s created after the September 2015 release. The HS-1-B question on the Compliance Explanations page of the eGC1 will now display under the additional condition of a Contract that is utilizing Just-In-Time human subjects approval. Conditional questions and instructional text in the Human Subjects section of the Compliance Explanations page of the eGC1 now update in real-time when the eGC1 is for a Contract. When a user is erroneously assigned multiple RegIDs at the University, it has caused problems with accessing their FIDS information. A change has been made to disallow multiple RegIDs for the same person in the SAGE database. Upon logging into SAGE, the user will receive an error that is also recorded in the SAGE Suite error log. This error will alert the SAGE team to take the necessary action to resolve the issue with UW IT. A validation was added to the Grant Runner detailed budget form to disallow zero entries in the “other” cost field. This will help mitigate submission errors. An issue that had prevented Funding Actions that predated the creation of the Authorized Action field from being opened in SERA has been fixed. The majority of the July maintenance release is focused on updating the way sponsored program activities are defined and clustered in SAGE on both the eGC1 and on Funding Actions. Prior to these changes, the “Funding Purpose” field on the eGC1 and the “Type of Award” field on the Funding Action tracked different but similar values. This causes confusion for consumers of the data and challenges in reporting to federal sponsors, since neither field aligns cleanly with the categories used for federal reporting. With the below changes, the eGC1 and FA activity types will be brought into alignment with each other, and with the federal reporting categories. Additional fields are also being added to extend automation of reporting further. On the Grant Runner detailed budget forms (project and subaward budgets) the key persons role type has been converted from a drop-down list to an open text box, to allow users to enter a wider range of other roles not previously listed. For example, users can now enter “Consortium PI” on the subaward budgets, or any other role type necessary. NIH Guidelines ask for detailed budget figures to be entered as whole dollars. In the indirect cost section of the detailed budget, where the total was automatically calculated based on rates and base amounts, cents were included without allowing users the ability to change the figure to a whole number. With this update, the indirect cost totals on the project and subaward detailed budgets and the modular budget forms will be rounded to the nearest whole dollar. In order to ensure attention is drawn to situations where an investigator may not receive a disclosure notification email, due to a missing email address, the PI & Personnel page of the eGC1 is being updated to display available email addresses. The available email address will display for everyone listed on the PI & Personnel page, and when one isn’t available a message of “Email Address Unlisted” will display in its place. In addition, if a disclosure notification fails to send to an investigator due to no email address being available, then the eGC1 Preparer will be sent an email they can forward to the investigator. In order to ensure that eGC1 preparers receive key email notifications generated from SAGE and SPAERC, including the newly added email above which forwards disclosure notifications when investigators cannot be reached by email, the Preparer’s phone number and email address are now required on the eGC1. Under certain circumstances during the updating of a PI on the eGC1, the entry was not saving correctly, resulting in the PI entry being blanked out and at times causing an error that the user could not resolve. This fix corrects the issue, allowing PI changes to be saved appropriately. The primary contacts on the eGC1 will now only receive the FCOI JIT email once, rather than anytime the contacts listed on the eGC1 change. In order to better monitor and meet proposal submission deadlines, eGC1 preparers will now be asked to provide the specific time of day and time zone for which the applications are due. These fields will display alongside the existing sponsor due date field, and will be required entry. A minor update was made to add a space between the word “Box” and the box number in the PI address on the SF424 and Key Persons Expanded forms in Grant Runner. This change will now present the address in the appropriate format. In an early February 2015 release, Grants.Gov updated their systems to allow many of the special characters that were problematic with submissions in the past to go through successfully. With this release we are updating SAGE Grant Runner to take advantage of this change as well. Grant Runner will no longer generate a validation error when users enter special characters such tildes, curly quotes, umlauts and other accent marks. This update will result in fewer submission errors and a more accurate read of the intended content. A recent upgrade of our PDF software caused inadvertent lines to show around tables of information in the eGC1 PDF due to a new default released with the software. We have applied an update that will revert the eGC1 PDF back to its former look and feel. The Grants.Gov RR Detailed Project Budget form will be made available in Grant Runner. This form supports the NIH SF 424 research opportunities where funding greater than $250,000 per period is being requested. With the addition of this form, users will be able to utilize Grant Runner for a much wider range of opportunities, taking advantage of the streamlining and time savings that Grant Runner is known for. An issue that was causing users to receive an error when attempting to print the Check for Form Package Errors page in Grant Runner has been fixed. A few minor corrections were needed for some of the validation messages. The error message associated with the Congressional District on the Performance Sites form was not fully displayed in the summary of error list at the top of the form. A pop-over message was inadvertantly showing when it should not have been for item 10 on the Research Plan form. Error messages associated with the attachments for the Other Project Information form were not clearing after the errors were resolved until the form was refreshed. The income budget periods section of the Cover Page Supplement form was inadvertently being hidden in the read-only view. On the Grant Runner Research Plan form, when the Application Type changed from Resubmission to New, and the user had already uploaded the Introduction to Application attachment, that attachment was appearing in the submission even though it was no longer required due to the type change. This scenario is unlikely to occur much if at all, but the fix assures that the conditionally-required attachment will not be submitted if the application type changes to one where this attachment is not applicable. On the eGC1 Abstract & RFA/RFP page, the RFA/RFP Number, Funding Announcement Title, and Funding Announcement URL will now be required. For Grant Runner applications, the URL will be defaulted, but users can edit as necessary. When a section of data is read-only, standard information that the user does not need to pay as much attention to. The SF 424 organization information is an example. Where users might want to see a summary view of larger collections of data within a form. Modular Budget, Key Persons Expanded, and Performance Sites forms are examples of forms where summary data is presented in accordions, with ability to expand to view more details. Wherever accordions are used, users will also see an “expand all/collapse all” link for quick “open/close” of accordions. For SPAERC views, all accordions will be open by default, per OSP’s request. Additional popover help text will display as the user is moving through fields, to guide users with detail of errors or omissions needing to be fixed before completion. A “Show Form Errors” feature link was added at the top of each form, to allow users to see all remaining errors on a given form at one time, with the guiding popover help text. The “Show Form Errors” feature will also display a summary list at the top of the form of all errors/omissions found. Where errors are found within an expandable accordion section, the user will see a red icon (exclamation point) to indicate an error that might at times be hidden from their view. This release also incorporates more of the NIH-specific requirements that exceed Grants.gov requirements, for a more comprehensive list of errors that are expected to cause problems on submission. Note that there is still work to be done to more fully incorporate NIH requirements, especially those that are activity type-specific. Future releases will be targeted for continued work in NIH requirements and error identification. On a final note, users will continue to be able to see the entire list of errors across all forms, using the ‘Check for Form Package Errors’ link on the left navigation menu. The Grant Runner section of SAGE has been updated to a more modern infrastructure. This will allow ORIS to more easily maintain and support the forms, and offers opportunities to improve the speed by which new forms can be incorporated into the system. This applies to only those applications using Form Set C.
The Key Persons Expanded form incorporates the new expandable accordion, which allows the user to see a high level summary of the persons included, while expanding to see each person’s full detail. This form will also now default the zip code (based on the box number) for the PD/PI and for any other persons added through use of the UW Directory “person lookup” feature. The Modular Budget form includes the new accordion feature which displays summary information for each budget period when closed, and exposes full period detail when expanded. Validation of budget start and end dates against project start and end dates, to alert users when budget periods fall outside of the project period range. Validation of period start and end dates to assure they do not overlap with a prior period. The Other Project Information page will now hide from the user’s view any questions that are not applicable, because they are conditioned upon another question’s yes/no answer. This is to reduce confusion over when questions are expected to be answered. The Performance Sites form incorporates the new expandable accordion, which allows the user to see a high level summary of the sites included, while expanding to see each site’s full detail. The user will also be provided with better help text for the congressional district field. The Introduction to Application attachment (item 1) will only display when the eGC1 Application Type is a Resubmission or Revision. This is to reduce confusion over when the attachment is to be used. The SF 424 form incorporates some new design elements to provide a more streamlined user experience. Expandable accordions are used to initially hide from view the details of the standard read-only organization information on this form, so that users can more easily focus on the required entry fields. Sections are re-ordered slightly, to make for a more intuitive, logical flow. User feedback indicated that the Wizard Detail Manager feature of Grant Runner was confusing and an additional burden to users, since the information editable through that section was data the users were accustomed to editing elsewhere for standard eGC1s. This feature will be removed from Grant Runner, and the affected data will be editable in the eGC1 instead. Application title, start and end dates, application type, and organization code are editable on the Details page. PI Details are editable on the PI and Personnel page. Opportunity information is incorporated on the Abstract & RFA/RFP page. Users will see a few new search features available to them, on the eGC1 and Approvals task lists. Users will now be able to jump more directly to a particular eGC1 from their My eGC1s or My Approvals pages, using a new eGC1 search field located on the task lists. Users can now search in My Approvals by personnel name. Search results will include all eGC1s for which they are an approver or watcher, where the chosen person is listed on the PI & Personnel page regardless of role type. The PI Name field has been added back to the My eGC1s Advanced Search tool, to allow users to quickly enter all or part of a PI’s name and initiate a search. This feature was removed in January, when the Personnel Search feature was added, but by user request, both fields will now be available for those that like the speed of being able to quickly find eGC1s by PI name. When a user performs an Advanced Search from the My eGC1s task list, they will be able to export their search results to Excel. The University District Building has been added to the off campus locations list found on the FG-2 compliance explanations section of the eGC1. It will now be easier for eGC1 Preparers to select that building when projects are eligible for the location designation of “off campus”, and will no longer need to enter the location address. Human Subjects Just-In-Time email notifications and GIM 19 deadline email notifications will no longer be sent to contacts for eGC1s that are after-the-fact or industry sponsored clinical trials. When users remove themselves from an eGC1 or budget, they will now receive a warning, alerting them that their access to that eGC1 or budget may be affected. When users remove their last access to an eGC1 or budget, they will now be redirected back to their task list. On the eGC1’s Cost Sharing page, a small bug was causing an error when attempting to enter in data into the Third Party Cost Sharing fields for the first time. This has been fixed. At times a 99 error would occur when editing an eGC1 where a budget was linked to multiple eGC1s and one of the eGC1s was in Denied or Permanently Withdrawn status. This has been fixed. As requested by campus in the ORIS Survey, the SAGE eGC1 copy feature will be expanded to also copy the sponsor address and contact information (if the sponsor on the original eGC1 is still active). Users will need to review the information to ensure it is up to date and accurate, but this change should reduce their data entry efforts. The PI Name field has been replaced with a more general Personnel field which allows users to search for any person listed on the PI & Personnel page. Once they have selected a person, they can refine their search by using the Role Type (Principal Investigator, Fellow, etc.) drop-down menu. They can also combine this search with the new Search Scope feature to find all the eGC1s a researcher is named on. Users now have the option of expanding searches to include all eGC1s. The search results will display all eGC1s that match the specified criteria. This enhancement will allow users to more easily find proposals that include personnel they’re responsible for. Previously, search results were limited to only those eGC1s that users could access. They will still only be able to open eGC1s they have access to. However, the research results now display a new column containing a link to the eGC1 contacts so users may contact them to ask questions and/or to request access. Research administrators for clinical trials have indicated an increase in work performed at the Seattle Cancer Care Alliance, and therefore requested to see this site added to the Locations drop down list in the compliance explanations section (FG-2). They will no longer need to select “other” and manually enter an address for SCCA with this change. SCCA is considered off-campus. This Grant Runner release is focused primarily on infrastructure changes that will allow ORIS to better maintain this component of SAGE into the future, and to more rapidly expand the system to include new forms. These changes will be mostly transparent to users, aside from a few minor tweaks to look and feel. To prevent unintended errors and confusion, the optional forms check box will be disabled (cannot uncheck it) while the user has that form open for editing. This forces the user to close out of the form completely before they can take the action of unchecking the form and thereby removing it from the submission. With the release of the form C changes, Grant Runner mandatory forms appear in a less-than-ideal order for users. We are bundling into this release the re-ordering of the forms, so that the SF 424 is always the first mandatory form shown. eGC1s that have Royalty Research Fund (RRF) as the sponsor will display a validation error if question FG-3, the question about F&A cost reimbursement, on the Compliance Questions page is marked as ‘Yes’. RRF requires FG-3 to always be marked as ‘No’, so this validation error is intended to ensure that the eGC1 preparer selects the correct response prior to completing the eGC1. The “Provide a reason” field when adding an Approver or Watcher on the Approval Flow Screen has been increased from 250 characters to 1000. Department and School reviewers who add additional Approvers and Watchers like to include detailed instructions in that comment box and needed a higher character limit. We now will show all recipients on the TO line of SAGE auto-generated email notifications. SAGE users will be able to see all persons who received the same Auto-generated SAGE email on the TO: line of the email. This was a frequent request from campus through our help desk and survey responses. Fixed the system to prevent investigators from receiving disclosure notifications when an old awarded eGC1 is opened. The system will now only trigger disclosure notifications when there is an investigator change made to the eGC1 (addition of an investigator or change of personnel to an investigator role). Human Subjects Just-In-Time emails will no longer be sent to the owners of eGC1s where the Royalty Research Fund (RRF) is the sponsor. RRF is an internal UW sponsor and operates differently than external sponsors. Unique characteristics of RRF opportunities include shorter application/review/award timelines and the lack of “fundable score” notifications. These unique characteristics therefore made the Human Subjects JIT email irrelevant and confusing for the owners of the eGC1. If an Investigator has never completed a disclosure in FIDS, or does not have any disclosure history for the past 12 months, a new user-friendly message stating there is no history will display when the Investigator Disclosure History link is clicked. A new error message will display in SAGE if you attempt to upload eGC1 attachments with invalid characters in the file name. To correct this issue, rename the file on your computer by directly typing in the characters before attempting to upload it in SAGE. To make it easy to find the list of current Public Health Service sponsors, we created a new PHS Sponsors web page.The FCOI online training and other communications will have links to this page. In compliance with the UW Records Retention policy, on October 1st, 2013, we will be removing attachments from grant applications (eGC1s) which were never awarded and have a sponsor deadline before January 9, 2009. This will free up storage space and simplify data management. The eGC1s without their attachments will remain in SAGE for reporting purposes. We informed all affected PIs on September 19, 2013. If the sponsor has not yet been filled in, you will not be able to send the notifications either. This will help ensure that the correct disclosure rules and requirements are applied when the investigators are updating their SFI in FIDS. We have improved the organization of the disclosures on the PI & Personnel pages. The primary disclosure will display in italics, followed by related disclosures ordered from most recent to oldest. Users will be able to view the one-year history of all of an Investigator’s submitted disclosures by clicking the new Investigator Disclosure History link. Changes were made to several of the Grant Runner forms with the new Form Set C version. Performance Sites: You may now list up to 300 sites. PHS398 Checklist: This form will no longer be in the set. Its fields were moved to the PHS398 Cover Page Supplement. PHS398 Cover Page Supplement: You may now enter up to 200 stem cell lines. The fields from the Checklist form were moved to this form. PHS398 Research Plan: The Planned Enrollment and Cumulative Inclusion Enrollment attachments will become their own new online forms. RR Key Person Expanded: You may now add up to 100 key persons. RR SF424: There is a new, required field for Change/Corrected applications, “Previous Grants.gov Tracking ID.” The Cover Letter attachment will be moved to this form. Cumulative Inclusion Enrollment: This is a new, optional form where you can enter enrollment data directly. This form replaces the corresponding attachment on the Research Plan. Planned Enrollment: This is a new, optional online form where you will be able to enter enrollment data directly. This form replaces the corresponding attachment on the Research Plan. Cover Letter: The form will no longer appear; its attachment will be added to the RR SF424 form. Notification dates were added to the PI & Personnel page. To help administrators know when to follow up with investigators, the PI & Personnel Page now displays the date when each investigator was notified by SAGE email to create a disclosure for an eGC1 and when the eGC1 reaches the Just in Time (JIT) phase. We fixed several bugs related to PI Assurance so that PI Assurance values will be retained and displayed appropriately. We also corrected all of the eGC1s that were affected by the bugs. In SAGE Budget, we revised how calculations are made for salary distributions. In the March 2013 release, we revised salary calculations to include additional earn types. We found a few rare cases where SAGE Budget lists inaccurate salaries when the salary distributions have not yet been entered into the HR database. We have now revised SAGE Budget to account for the distributions which are not in the database. We updated our tools’ styles. SAGE Budget: Preliminary Benefit Rates are now available to users of SAGE Budget. GIM 3 has been updated to display both current benefit rates and preliminary benefit rates for future budgeting as they become available. SAGE Budget will use the correct rate based on the period start date and whether the user has opted to use current and preliminary rates or current-only rates. Budget preparers can use a global update feature to update their budgets quickly when preliminary rates become available each year. The period entry page for a given person will indicate whether the rate being used is current or preliminary for that period. An ASTRA information page will display instead of an error message at sign in. When you attempt to log in to SAGE without the required ASTRA role, SAGE will display a list of people in your unit who can authorize access to SAGE. You able to choose an authorizer and send him or her a message to request access to SAGE. Designated Subcontract Actions (SA) attachments are viewable in SAGE. Subcontracts Actions (SA) attachments will now be viewable in the Related Documents section of the Attached Documents page if the SA is in Active or Closed-Out status and if the type of attachment is not a To/From Communication. Anyone diving under the University of Washington’s auspices must have current certification as a University of Washington Scientific Diver and adhere to the standards set forth in the UW’s Diving Safety Manual. EH&S will contact you to assist in meeting Diving Safety Program requirements prior to diving. SAGE Budget: In the Salaries and Wages section of the Worksheet, additional earn types such as administrative supplements are selected by default, but users may deselect them. eGC1: Related disclosures are now displayed in the Compliance Details column in the Personnel section, on the PI & Personnel page. eGC1: The Environmental Health and Safety (EH&S) Department revised their compliance questions. The changes were made to reflect regulatory and EH&S program updates. The Advance Budget Number Request form signature disclaimer was modified to show new wording. The Ready to Submit (RTS) field on the Certify & Route page is now required on all eGC1’s. Users will be unable to withdraw the eGC1’s once RTS is answered “Yes” and the eGC1 is at “In OSP” status. They will have to request that OSP return it. A new message will display informing users which OSP person is handling their application in case they need to contact OSP for a correction and return of the eGC1. On the eGC1’s PI &Personnel Page, FIDS Disclosure Review and FCOI statuses now display in the Compliance Details column. These changes were made as a result of introducing the new Financial Interest Disclosure System (FIDS) which integrates with SAGE. eGC1 Preparers can select Investigator status. Disclosure notifications to investigators to complete a disclosure in FIDS can now be sent. Each investigator’s SFI status will display based on the information in FIDS. The PHS FCOI training status will display. The FIDS disclosure status will display. Changes may be made to the PI or personnel after the eGC1 has been approved by OSP. The history of any post-approval PI or personnel changes will be displayed. An eGC1 cannot be completed until all investigators have received disclosure notifications. The Ready to Submit question cannot be answered as “Yes” until all investigators have completed their disclosures in FIDS. The Security and Export compliance questions have been revised, and a new one has been added concerning access to classified national security information. Answering “Yes” to the new question will generate a new Security Reviewer approver node on the approval graph. The SAGE Budget export now contains data formatted to simplify data entry for the SF424 forms. You will find this information following the usual export data. When adding an ad hoc approver or watcher, a new validation checks for any mismatch between the Role chosen and the level of the associated organization code. When OSP marks an eGC1 as eligible for an Advance Budget Review, the eGC1 owners will automatically receive an email message. When users look up personnel, the results will contain the employee identification number. This will allow users to quickly differentiate between personnel with similar names. You may now delete an eGC1 sooner. You must have read/write access, it has been more than six months since the eGC1 has been completed, and the eGC1 is in Withdrawn or Returned status. If you create new budget and complete all of the steps until you reach the access page where you add and remove an admin/budget contact, you will see the full budget navigation instead of the wizard. Hyphenated names now display properly. Advance budget is marked as ineligible when a user copies an older eGC1. Budget and eGC1 Preparers, formerly known as Creators, may be updated by anyone with Read/Write access. This allows you control who gets notifications for an eGC1. Users can enter or update access information once, and it will display on the centralized access page shared by both an eGC1 and its connected SAGE Budget. Users with global edit access for an eGC1 will also have read/write access to the connected budget. A validation message will be displayed if a user attempts to add a person a second time on the eGC1 PI and Personnel page. All new approval snapshots will be in PDF format; the HTML option has been removed. Personnel from older eGC1s who showed up as duplicate owners will now be displayed once. The Advance Budget Form has updated instructions. We have created a new Advance Budget Job Aid which you can find on the My Advance Requests page. The SAGE Budget wizard can now handle F&A rates correctly for grants which go beyond the agreement dates. On applications which use human subjects and stem cells, you cannot leave comments without choosing a Type on the Compliance Explanations page. SAGE will only copy valid 4th level org codes. Incorrect and expired org codes will be removed from copied eGC1s. In Grant Runner, the PHS398 cover letter Update and View links will now display correctly. You will not be able to select or copy inactive sponsors on your eGC1, and SAGE will remove inactive sponsors from copied eGC1s. The new School of Medicine compliance sub question, HS-1-B, will generate a message to let you know what type of Clinical Research Budget & Billing Support Office (CRBB) review is needed. This question is triggered only for eGC1s which involve the use of human subjects, and will appear once the Project Type and HSD Application type are selected. 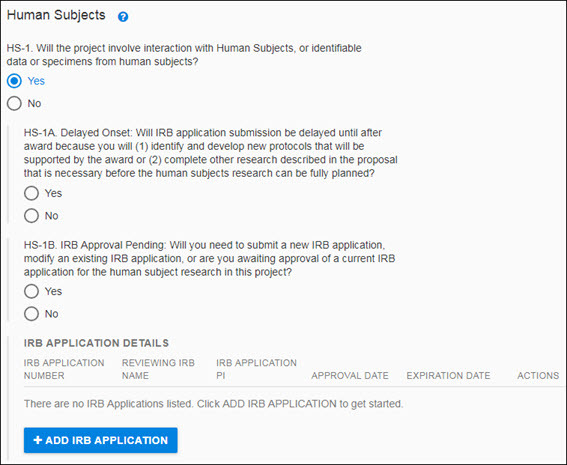 Human Subjects compliance question HS-2 now displays in the SAGE Approval Application Summary when the research involves the use and/or creation of human embryonic stem cells. SAGE users will be required to select or specify an organizational code which ends in fewer than four zeros. When an eGC1 with any EH&S compliance question answered “yes” is funded, EH&S will be notified. Fixed the PAC notifications so that all Pre-Award Budget Contacts, eGC1 Creators, and Administrative Contacts will now receive Post-Award Change (PAC) email notifications. The F&A checkbox displays correctly when the F&A rates are customized at the period level in SAGE Budget. New Grant Runner submission page shows all status information for Grant Runner Applications, including Grant Tracking Number, Sponsor Assigned Number, and History & Comments. The “Application Documents Information” section now displays on the “Certify & Route” page. The “Attachments & Routing Questions” page has been renamed “Attached Documents” and no longer includes routing questions. The “Certify, Complete & Print” page has been renamed “Certify & Route”. The “Ready to Submit” question has moved to the “Certify & Route” page of the SAGE eGC1. SAGE Budget: When a line item is deleted from the budget worksheet, the page refreshes to reflect the change. However, if a budget has Targets & Limits enabled, the F&A values displayed are not immediately updated. The next time the page is refreshed, the displayed F&A values will be correct, and the Total Project Costs will include the F&A change. Budget period naming conventions have been enhanced to include the most common period names. Budgets built in SAGE can now be connected to an eGC1, so that any updates made to the budget automatically display on the budget page of the connected eGC1. Budgets in SAGE route with the eGC1 they’re connected to and anybody with access to eGC1 will also have access to the budget. The worksheet in SAGE Budget displays the eGC1 number and status of connected eGC1s. Fiscally responsible departments can now be specified on the setup screen for sub budgets. New Budget Edit Numbers in the Budget History enable users to see when a budget has been revised and to read comments associated with those changes. OSP Administrator/Coordinator now has read access to Budgets built in SAGE. SAGE saves all changes to budget and assigns a unique Budget Edit number and timestamp to versions created at critical points in workflow, such as at submission or approval. Users can access a read-only view of a budget at a specific point in time from the Budget History and copy, print, or export it to Excel. Users can access an Excel version of a connected budget from the eGC1 Attachments page under Connected Budget Data. Users with the appropriate permissions can view or withdraw the eGC1 and budget from the Budget History tab. Ability to define lines that automatically adjust their amounts to make selected total match target amount. Ability to see sub-budget information for awards where proposal includes an associated SAGE Budget. Error when opening Targets and Limits auto-adjusting entries with read-only access. When a user adds TBD personnel to a sub budget, the salary that is created in the setup screen is not transferring to the period set up. The first period starting monthly salary should match the value defined on line setup, instead it is $0. Changes to how dates are calculated in SAGE Budget may cause a discrepancy between effort months and period length in a select number of budgets. Each of the affected budgets has a salary line item where the number of effort months originally calculated does not match the number of effort months that the current date calculation produces. This means that the effort months in the budget period now exceed the period length. Period months incorrect when period start and end dates are in months of different durations (e.g. 28, 30, 31 days)-Current production issue discovered during Budget 2.2 user acceptance testing. When creating a period that has dates that start/end mid-month in months with a different number of days, the period months on salary lines may be calculated as a whole number where a user may otherwise expect them to be. For example: a period starting on 1/16/2011 and ending on 4/15/2011, period months comes out to 3.0161. In a Grant Runner application that has been withdrawn or returned for updates, if an Appendix file is added immediately after updating the Research Strategy file, the Appendix file will appear in the Strategy section. The Advanced Search for Approvals has two issues. First, if both the Date Approved After and Before fields are used to set a date range, the system will not return any results. Using just one date fields works correctly. Second, if a very large number (such as an org code) is mistakenly entered in the eGC1 Number field, an error (99) will occur. When a user chooses the Organization Code Receiving Funding, the UW Box Number will be automatically populated. Users can still edit the field as needed.